OK these images are NOT from my recent web surfing but from the book To Have & to Hold by David Stark and Avi Adler (the book I got from Target's Club Wed). 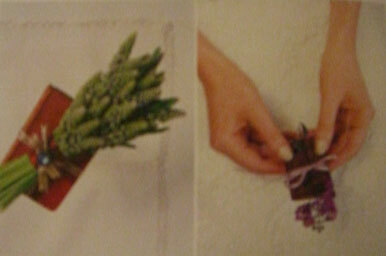 Sorry these images are not very crisp (I don't have a scanner and I kinda like how they came out a little grainy). 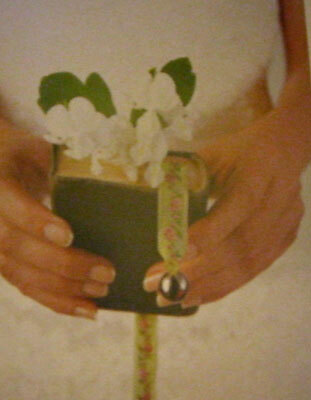 Like I mentioned previously, I wanted to incorporate my Bible with my flowers. The problem is figuring out what flowers go well with it. I think it has to be a pretty small nosegay b/c it will be too difficult to hold otherwise. Flowers that I'm considering: hydrangea, peony (so pretty, but out of season), zinnia, anemone, calla lilies (not sure if these are feasible b/c you would need a whole bunch to make an impact). 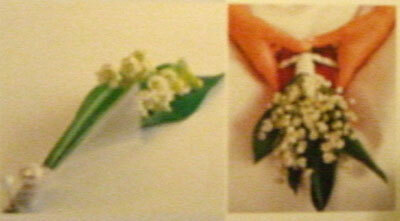 Obviously the one on the left is a boutonniere. Or just a bunch of callas like this picture (I was watching a rerun of "Friends" recently and had to look up some images). I like this pic also b/c Monica's dress is similar to mine and I'm thinking of copying her w/ her hairstyle -- it is simply pulled back at the top with a fancy barrette (but I think I would curl mine more) and then a floor-length veil. She also lets her hair down completely at the reception.